Shore C/0: foam, sponge, etc. Shore D: plastics, formica, epoxides, plexiglass, etc. 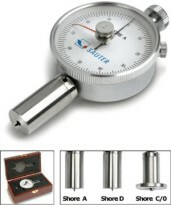 The basic principle is to use an impact body of certain weight impacts against the testing surface under certain test force, then measure the impacting velocity and the rebounding velocity of the impact body respectively when the spherically test tip is located 1 mm above the testing surface.